Hot Melt Adhesives Market size was above USD 5.5 billion in 2015 with gains expected at above 6%. 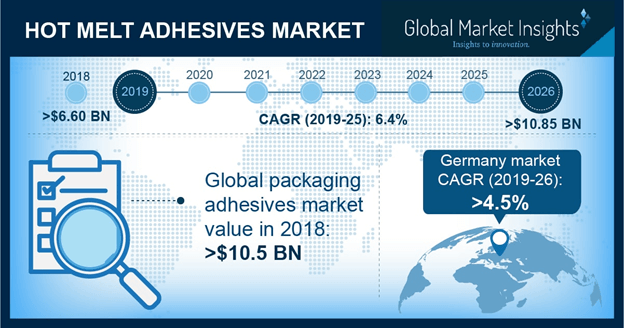 Strong application scope in packaging, disposables, automotive and footwear industry should drive hot melt adhesives market size. Favourable government regulations by EPA and REACH regarding use of eco-friendly products should fuel product demand in Europe and North America. They are categorized under environment friendly, safe for human use and VoC free thermoplastics which are suitable for use in storage, production and transportation. Key properties include longer shelf life, fast drying, cost-effective, easily disposable, and can be reused without degradation. Europe packaging industry accounted for over 30% of the total demand in 2015. Rise in per capita disposable income along with consumer awareness towards green packaging should drive regional industry growth. Hot melt adhesives (HMAs) are used in packaging agricultural and food & beverages products to preserve and protect them from damage. Vegetables are packaged in corrugated boxes owing to the versatility, serviceability, stacking strength, and low production cost. Global automotive market size was over 90 million units in 2015 and may exceed 115 million units by 2024. Hot melt adhesives are used in door sealant, seating, exterior trim bonding, auto seat upholstery, water shields, headliner attachment, and package tray attachment. It is used in auto assembly due to bond flexibility for movements including expansion and contraction. In addition, it creates tough and impact-resistant bonds that are chemical and weather resistant and have a high abrasion resistance and high shear strength, thereby influencing automotive sector. HMAs offer advantages such as low VoC emissions, easy application by glue gun, and quick curing time. Automotive application reduces VoC to safe and stable vehicles even under extreme heat conditions. Solvent based PURs are preferably used in laminating and food packaging industries. Ethylene vinyl acetate (EVA), polyurethane, polyamide, styrenic block copolymers, and polyolefin are key raw materials used for manufacturing process. EVA is the most abundant used hot melt glues owing to its low cost and superior performance, thereby used in automotive, paper, packaging and woodworking industries. Polyolefins based glues are also used in packaging industry and costs more than EVA. Fluctuating raw material costs can widen supply demand gap and affect hot melt adhesives market price trend. EVA hot melt adhesives market size should surpass 3.5 billion by 2024. Increasing application scope in automobile, woodworking, and paper industries owing to its dependability, intact adhesion, versatility, and durability should drive industry growth. They are specially designed to adhere to paper stock, aqueous coating, and waxes thereby promoting their usage in packaging industry for labelling, plastic film, and carton sealing. MPO may witness gains at over 5.5%. It is widely used in packaging application for carton closing, tray sealing, shoe box forming, gift box assembly, and heat resistant carton closing. Technological advancements along with rising emphasis on safe, durable and reliable packaging materials may stimulate product demand. Amorphous poly-alpha-olefin (APAOs) hot melt adhesives may register close to 5% growth. They are used for repairing trucks, cars, motorcycles, and marine crafts. Increasing application scope in automotive industry for car seats, hot line fixing, and tail lights, headlights, door panels, and dashboard trims on account of chemical inertness, corrosion UV rays and high resistance to moisture. PU hot melt adhesives market may witness significant gains over the forecast timeframe. It is used in electronics, pharmaceuticals, and cosmetics industries owing to its flexibility, moisture & temperature resistance, and better adhesion properties. Positive outlook towards using negligible VoC content products along with increasing bio based products demand should fuel industry growth. Hot melt adhesives market size from packaging application should witness significant gains at over 5.5%. They are widely used in paper board carton & corrugated case sealing along with can, plastic bottle, and glass. Rise in labels, tapes, and films production for packaging applications along with regulations regarding food contact materials safety mainly in China and India should drive industry growth. Hot melt adhesives market from disposables may surpass USD 1.6 billion in business by 2024. Styrene block copolymer and amorphous poly-alpha olefin based hot glues are prominently used in hygiene products. Increasing application outlook in baby diapers, adult incontinence and female hygiene products should drive industry growth. Hot melt adhesives market size from footwear applications should witness gains at over 4%. Increasing fashion consciousness and availability of various international brands prominently in the U.S. and Europe has led to rise in high quality footwear demand. HMAs market size from pressure sensitive applications should witness significant gains over the forecast timeframe. They are used in various categories of binding materials used in industrial and consumer applications. Low cost, thermal stability, UV resistance, and chemical resistance are key properties making them suitable for labels, tapes, electronic, bookmarks accompanied with aircraft in cockpits and cargo holds. Europe hot melt adhesives market size should witness highest gains at over 4.5%. Positive outlook towards packaging & automotive industry growth along with government norms to curb VoC emissions should drive regional industry growth. Germany should witness significant gains at over 4.5% by 2024. Increasing high quality footwear, protective shoes, and sportswear should drive regional growth. Regulations by EPA and REACH regarding environmental concerns along with usage of bio-based products in food packaging may fuel product demand. China hot melt adhesives market size may witness an increase in demand due to strong application scope in furniture and construction industry thereby stimulating EVA, PUR, and polyamide based products. Manufacturers in China are producing less VoC content products which are extensively used in packaging, automotive, electronics and hygiene applications. Brazil hot melt adhesives market size may register close to 5.5% by 2024. Positive indicator in construction spending along with increasing pressure sensitive product demand in furniture sector should drive regional growth. Global hot melt adhesives market share is concentrated with companies focusing on product differentiation and price. Most of the glue manufacturers are forming alliances with companies to develop bio-based products and thereby expanding business in various regions. Some of the companies present in this market include Henkel AG, H.B. Fuller, Bostik, 3M Company, Dow Chemical, Jowat, Avery Dennison, Ashland, Tex Year Industries and Hunstman Corp.
Change in consumer lifestyle along with rise in economic standards may contribute towards furniture sector. Many prominent carpenters, contractors, and manufacturers are producing wood furniture thereby influencing industry product demand.